Rev. Manuel P. Loughran, CSV died on Monday, June 21, 1993 at St. Joseph Home in Palatine, Illinois at the age of 87. Manny Loughran was born on Christmas Eve 1905 in Coatbridge, Scotland, the son of Patrick and Anna Loughran. 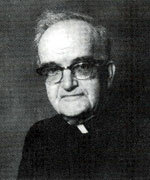 After graduating from St. Viator Academy in Bourbonnais in 1923, Father Loughran entered the Viatorian Novitiate in Chamberlain, South Dakota in August of 1923 and pronounced his first vows at Maternity B.V.M. Church on August 16, 1924. He was a graduate of St. Viator College in 1928 and was ordained to the priesthood on June 29, 1932. Following his ordination, Father Loughran began a long career in education and Christian formation. From 1932 to 1939 he taught at Fournier Institute, Cathedral Boys’ High School, St. Viator College and St. Philip High School in Chicago. From 1939 to 1944 he served as Novice Master for the Province. Associate Pastor at St. Joseph Church in Springfield. After six years at St. Joseph’s, Father Loughran moved to St. Francis Motherhouse in Springfield in 1974 to serve as Chaplain for the Franciscan Sisters. 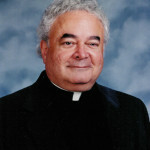 In 1978 he was named Pastor of St. Jude Parish in Rochester, and in 1980 he moved to Joliet to become Chaplain at Our Lady of Angels Retirement Home. From 1983 to 1989 he served as Chaplain at Our Lady of Victory Nursing Home in Bourbonnais and St. Joseph Home in Palatine. In January of 1990 he retired to the Province Center where he remained in residence until suffering a severe stroke in early 1993. Father Manny recently moved to St. Joseph Home for the Elderly in Palatine where he died. Visitation for Father Loughran was held on Friday, June 25, 1993 from 4:00 p.m. until 8:00 p.m. at St. Joseph’s Home for the Elderly, Palatine, Illinois. A prayer service was held at 7:30 p.m. The Funeral Mass was celebrated at 10:00 a.m. on Saturday, June 26, 1993. Burial was in Queen of Heaven Cemetery. Father Loughran is survived by two sisters Ann Loughran and Lorraine Cushing, as well as many nieces and nephews. Remember Father Loughran in your prayers and gather together in local communities to remember him in Eucharist.